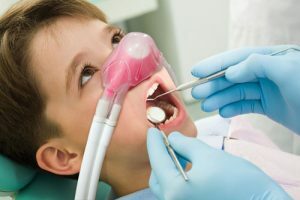 Our dentists understand that some patients who visit our dental practice may feel anxious, so we provide nitrous oxide. Also known as laughing gas, you inhale this gas during dental procedures to help you feel relaxed and comfortable. Nitrous oxide is a good option for any of our patients who suffer from dental anxiety or dental phobia. If you feel anxious because you are receiving a treatment you have not experienced before, or if you simply dislike the sounds and sights of the dental office, we may recommend nitrous oxide to help you feel more relaxed. Be certain to discuss your concerns with our dentists and dental team before your visit so we can help you feel more comfortable during your treatment. We invite you to contact us today to learn more!